The Rivals Camp Series presented by adidas is expanding in 2018 with additional opportunities for players. All events are free. The Rivals Five-Star Challenge – which brings together the best players in the country – will be held in June. A combine only will be held in Baltimore and Chicago. The Rivals adizero Combines, for players graduating in 2019-2022, will be held on Saturdays. Players will record times in the key football testing areas: 40-yard dash, Shuttle Run, 3-Cone Drill, Vertical Jump and Broad Jump. All players will receive a Rivals profile, and top combine performers will have an opportunity to earn an invitation to the Rivals 3 Stripe Camp the following day in the same city. Baltimore combine participants can earn a camp spot to a nearby regional camp. No players will earn spots out of the Chicago combine because it is the season-end event. 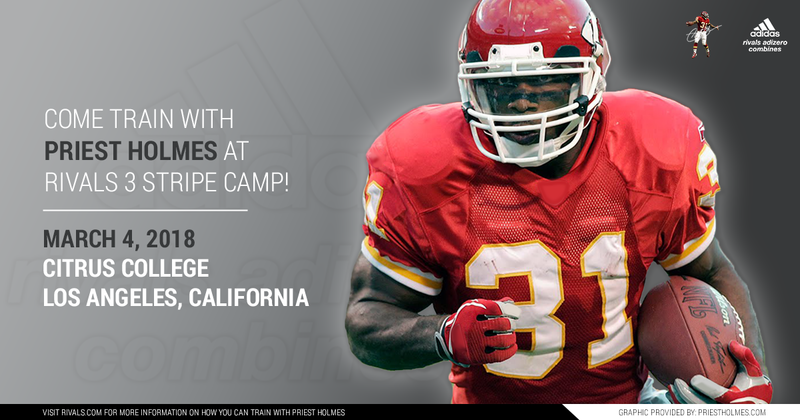 Players attending Rivals 3 Stripe Camps – considered the premier events in the country – will receive instruction from top former NFL and college players and coaches in the morning, then compete one-on-one in the afternoon. Players who have attended Rivals camps comprise a Who’s Who in the football world – from current NFL players Jalen Ramsey, DeShaun Watson and Adoree Jackson to soon-to-be drafted UCLA quarterback Josh Rosen, Heisman Trophy winner Lamar Jackson, Penn State running back Saquon Barkley and Minkah Fitzpatrick of Alabama. Rivals was the first digital company to recognize the need for in-depth recruiting coverage and to supply it nationally. Rivals revolutionized recruiting coverage as the first organization to provide innovative features like national player rankings, online video highlights, a searchable player-profile database, official visit lists, recruited-by- coach tracking and more. The Rivals 3 Stripe Camps and Rivals adizero Combines dates and locations are below, followed by the Rivals Camp Series FAQs. Who can attend the Rivals Camp Series event? The Rivals 3 Stripe Camps and Rivals adizero Combines are a series of 12 regional camps and 14 combines. The camps are geared toward current juniors, but sophomores and freshmen are eligible. Top performers could qualify for a spot in the Rivals Five-Star Challenge, an annual event that has been held at NFL stadiums such as Chicago’s Soldier Field, Baltimore’s M&T Bank Stadium and the Georgia Dome. Combines are geared toward freshmen, sophomores and juniors. Top performers at a combine could earn an invitation to attend the camp the following day in the same city. What is the cost to attend the Rivals Camp Series Presented by Adidas? All Rivals 3 Stripe Camps and Rivals adizero Combines are free. Prospects must provide their own transportation to camps. How can a player register for the Rivals 3 Stripe Camp? Coaches or players who would like to nominate a player can do so at the following link: https://n.rivals.com/underclassman_form. Over the coming months, if anything changes, new offers, significant updates, then please update us with this information in a brief email to info@rivalscamps.com. Only players who receive a code from a Rivals analyst can sign up. There will be no walk-ups at camps in 2018. Some spots will be awarded to top performers at the Adizero Combines, and players can also earn an invitation through VTO camps. Information on VTO camps will be released soon. How can a player register for the Rivals Adizero Combine? Players can sign up for a combine by clicking on the “register” link in the schedule. Advance registration is strongly suggested. Walk-ups are likely to be allowed to participate after the registered players have competed. What happens at a Rivals 3 Stripe Camp? Players will have their photo taken and do media interviews. After a dynamic warmup, players do position-specific drills (QBs, RBs, WR/TEs, OLs, DLs, LBs and DBs) with highly qualified and experienced coaches to work individually on football skills and techniques and then do one-on-ones. The one-on-ones are the highlight of the camp, during which WRs will go against DBs, RBs square off with LBs and OLs battle DLs. QBs will alternate throwing to WRs and RBs at different times. What happens at a Rivals adizero Combine? Players will have an opportunity to have their times recorded in all the key football testing areas. Players will be timed in the 40-Yard Dash (two runs, fastest time recorded), Shuttle Run (two runs, tests athlete’s lateral quickness and explosion), 3-Cone Drill (tests athlete’s ability to change directions at a high speed), Vertical Jump (measures lower-body explosion and power) and Broad Jump (tests athlete’s lower-body explosion and strength). All players who test at a Rivals adizero Combine will receive a Rivals profile, so each player will have his picture taken and his height and weight measured. What are the player benefits for attending a Rivals 3 Stripe Camp? Players participating will be given the chance to earn national exposure from Rivals.com by competing against the best. Video and action photos will be taken, players will be evaluated by numerous Rivals.com analysts at each event and athletes will learn more about what it takes to compete at the highest level and gauge their current abilities against others at the same position. What are the player benefits for attending a Rivals adizero Combine? In addition to receiving a Rivals profile, players who have recorded times from a reputable combine have a leg up when discussing scholarship opportunities with colleges. NCSA, the top recruiting service in the country, will be on site to help explain the recruiting process to players and parents. In addition, top performers at each combine will be invited to participate in the Rivals 3 Stripe Camp the following day in the same city (except in Chicago). What should players bring to the camp? Players participating in the Rivals 3 Stripe Camp will need to bring a pair of cleats and mouth guard. Gatorade will provide hydration; players are encouraged to eat a healthy breakfast the morning of the camp. What should players bring to the combine? Players participating in the Rivals adizero Combine need to bring a pair of cleats. No track cleats are allowed. Gatorade will provide hydration; players are encouraged to eat a healthy breakfast the morning of the camp. If a player is already being recruited should he still attend the camp? Yes. The Rivals 3 Stripe Camp is a tremendous way to attract attention of schools from the around the country who will be reading articles and watching video on Rivals.com. The camp also is a great way to be coached by some of the best, improve your technique and compete against top players from your area. Players might qualify to earn a spot in our prestigious national camp and show our analysts and college coaches around the country that they are competitors. What level of competition should a player expect at the camp? Players at the Rivals 3 Stripe Camp should expect to go against the very best in their region. Rivals.com is the biggest and best recruiting website in the country and top prospects are always trying to improve their ranking as well as their stock with college recruiters. Colleges cannot attend camps in person, per NCAA rules, so they view the action through the stories and lists written by our analysts and the video shot by our videographers. The best of the best will be attending these events. Would a poor performance at a camp hurt my ability to be recruited? A poor performance at the Rivals 3 Stripe Camp will not hurt your ability to be recruited, as our team of writers focus on the top performers at each event and don’t call out poor performers. However, we provide no promises when it comes to our national rankings and we expect some players to raise their stock with our analysts, while the stock of others could drop. However, the instruction a player receives at the camp and the opportunity to gauge his current skill-set against the very best is what makes these camps invaluable. We have a saying in the camp business – “you can’t get better sitting at home” – and we expect the best of the best to want to prove they belong in that select company. Will attending a camp or combine potentially help my ability to be recruited? Yes. A good performance at the Rivals 3 Stripe Camp or posting top times at the Rivals adizero Combine can certainly help your ability to be recruited. We have seen interest from colleges increase dramatically for prospects that do well at Rivals camps and combines. Please email questions to info@rivalscamps.com.